« We Have Been Shortlisted for the Best Small Shop in Britain! Staff and volunteers at Ilsington’s community shop are hoping a trip to the House of Commons next Wednesday will see them crowned the nation’s top small store. The business, owned and operated by villagers since 2012, has been shortlisted in the 2015 Parliamentary Best Small Shops Competition. It is the only community-run venture to have reached the final 20, judges from the All Party Parliamentary Small Shops Group having considered 300 entries. The good news arrived on Friday the 13th. 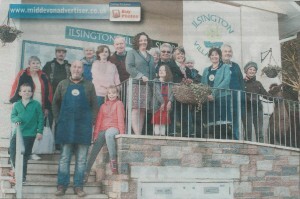 Ilsington lost its shop in 2009. Residents set about raising £250,000 to upgrade the village hall, creating a meeting room and retail space in the process. It had been hoped that by the end of the first year’s trading in the summer of 2013 the business would have taken £110,000. Instead, the final figure was closer to £170,000 and the business continues to thrive. Mrs Schramm is due to make the trip to London with committee member Kirsten Day.